The nation paused yesterday to pay tribute to a pioneer, leader and a father figure in Tuiloma Pule Alaimoana Unasa Lameko Gae’e. The Member of the Council of Deputies and long serving Parliamentarian was laid to rest at his Alafua residence. The burial was part of a state funeral, which started at Tuana’imato. Described as one of the Samoa’s longest serving leaders, it was a sad day for hundreds of mourners who gathered to pay their respects. 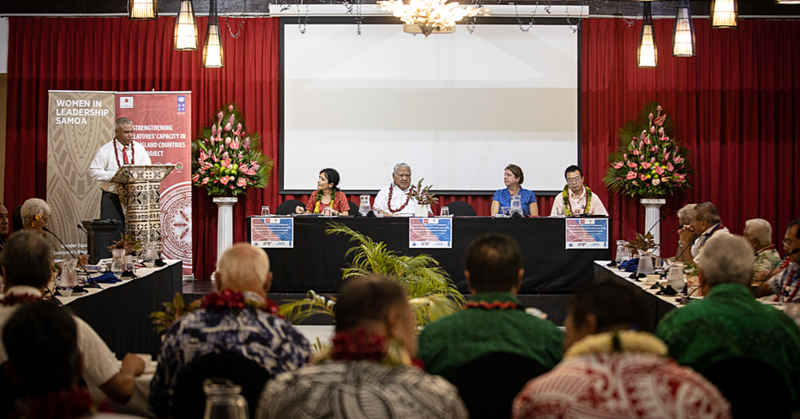 The Head of State, His Highness Tuimaleali’ifano Va'aletoa Sualauvi II and his Masiofo, Her Highness Fa'amausili Leinafo, were among them. They were joined by Member of the Council of Deputies, Cabinet Ministers, and Members of Parliament, Government officials, friend and families who paid their respects at the State Funeral held at Parliament. The service was led by Reverend Aisoli Iuli, who is Deputy Chairman of the National Council of Churches. Born on 6 July 1935, Tuiloma passed away peacefully on 1 April 2018 at the Moto’otua hospital. Prime Minister Tuilaepa Dr. Sa’ilele Malielegaoi presented his son, Member of Parliament, Aumua Leavasa Siliili Isaia Lameko with the national flag as a token of appreciation from the country for his life of service. 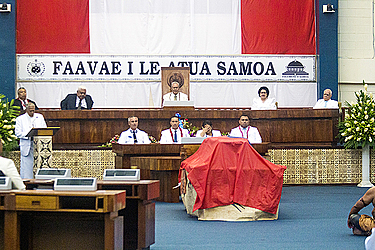 In his eulogy, Prime Minister Tuilaepa acknowledged Tuiloma’s contribution to the development of Samoa over the years. He described him as a hard working leader and someone who fought for the good of Samoa. He also paid tribute to Tuiloma as one of the founding members of the H.R.P.P. along with Le Mamea Ropati, the remaining Member of the Council of Deputies. He recalled how he held two birth certificates. 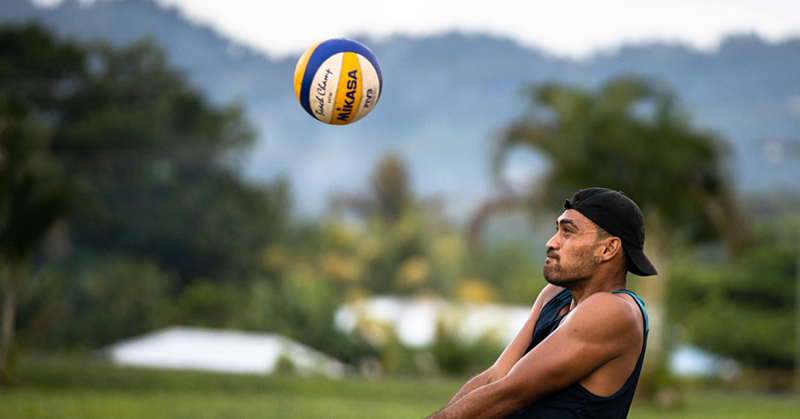 Tuiloma Lance described his father as a loving and caring person who held his family together. “He taught us the importance of working hard and to put education as a priority. “He also emphasized the importance of serving the church. “A family man, who was a lay preacher of the C.C.C.S. an Orator and High Chief, who was God’s gift to our family. “A great man who; lived his life to the fullest until he passed away at the age of 82. “We are proud of his achievements in life to be founding member of the H.R.P.P. and one of the longest serving politicians in Parliament for 32-years. “A fellow chartered accountant, an auditor and a business man who was a money saver who always asked for a bank statement from the bank. 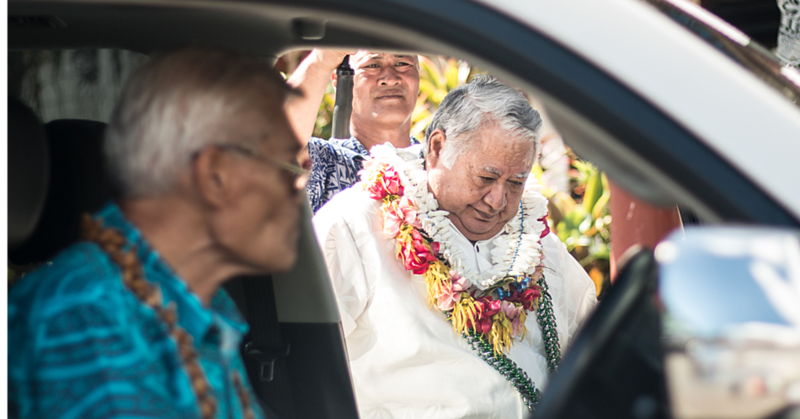 “He loved his children and 16 grandchildren and will be sadly missed,” said Tuiloma Vui. He was married to Melini Liu Fa’aesea who had since passed away. Tuiloma is survived by his children; Vui Lameko; Aumua Leavasa Si’ili’ili Isaia; Toleafoa Manufalealili Dr. Viali; Fumuina Taua Esther, Taitu’uga Maryanne; Sailimalo Gae’e and Eveline Fareti; Mamea Mariota. 1991 To 1996 in Tofilau Eti Alesana's Fourth Administration (HRPP), Member Of Parliament, Safata (11th Parliament of Samoa), - Minister of Sports & Cultural Affairs. 1988 To 1990 In Tofilau Eti Alesana's Third Administration (HRPP), Member of Parliament, Safata (10th Parliament of Samoa), Minister of Agriculture. 1975 – Seconded To The International Monetary Fund (IMF), Washington DC.